Hiroshima. Photographs of Hiroshima before 1920. Hiroshima and Nagasaki were the two "open cities" in Japan, and had a trading post with the Dutch, which, some say, was Japan's only window to the outside world. Both cities had major Catholic and other Christian populations. In 1853, the Russians and a few months later the Americans, negotiated limited trade and coal fueling rights with the existing power structure. Great Britain and other European countries soon also developed trade relations with Japan. After the "Meji Restoration", in 1867, other cities beyond Hiroshima and Nagasaki were included as authorized ports of call. Hiroshima was also known as a military city and was the staging ground for the sneak attack on Russia in 1904, which started the Russian-Japan war. Russia was having a revolution in Moscow at the time and found it difficult to maintain the war with Japan and even though Russia's losses were only half that of Japan, Russia sued for peace, which was concluded in the Treaty of Portsmouth, hosted in Portsmouth, Maine (USA). As a result of Russia's capitulation, Russia had to give up the two railroads that it had built through China as well as gave up various spheres of influence in Chosen (now called Korea) as well as China and elsewhere. This, set the pattern for many abuses that occurred between 1905 and 1945, when Japan had to give up these gains. We have extensive Japanese and Korean documents, including early Japanese trade directories, phone books, magazines and captured films, from this period. The initial attack on Russia, in many ways resembled the attack on Pearl Harbor, 37 years later. 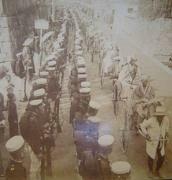 Troops marching in Hiroshima in 1905, presumably ultimately going to the Russian front. Hiroshima hospital in 1905. This author has several books from this period, covering the activities in and around Hiroshima. 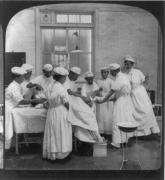 Some of the nurses in this hospital were Americans. Military wounded in Hiroshima, after leaving the Russian front in 1905.